Splinter Of The Mind's Eye: The Star Wars Sequel That Could've Been | Warped Factor - Words in the Key of Geek. On November 12th 1976, approximately six months prior to Star Wars arriving in cinemas, the novelisation of the movie was released. Titled 'Star Wars: From the Adventures of Luke Skywalker', it was solely credited to George Lucas, but actually ghostwritten by Alan Dean Foster. Foster was given extensive access to the shooting and draft scripts, as well as early story treatments, for use as source material in fleshing out the novel. Foster not only adapted the film's events, but also expanded the backstory of time, place, planets, races, history and technology. The result was a story that differs slightly from the one that ended up in the movie in several ways, and contains some continuity errors in light of the sequels. Foster was also contracted to write a second Star Wars novel. One that, if the movie proved to be unsuccessful, could be used as the basis of a low budget sequel. That novel is Splinter Of The Mind's Eye. Foster delivered a quick moving adventure, one that is quite small in scope (but that would've been the brief) but not without some merit. It's also technically the first example of the Star Wars Expanded Universe, being that it does not fit in with the eventual story-line depicted in the movies. The fact that it does differ is the biggest challenge for any reader when approaching this novel, as it's hard to dismiss knowledge of the cinematic Star Wars saga that we all know so well. Luke and Leia's relationship, for example, is bordering on a romantic one, and so whilst that is jarring you really have to read this story knowing that Foster only had one movie to base his characterisations on. In that respect, it would have been the logical route to go. Alongside Luke Skywalker and Princess Leia, the principal characters featured in the novel are C-3PO, R2-D2, and Darth Vader. Han Solo and Chewbacca do not appear, and Solo is only referred to by Luke Skywalker at the end of the book when he talks about "a pirate and a smuggler" that he knows. The eponymous "Mind's Eye" of the story is a MacGuffin called the Kaiburr crystal. This was based on the "Kiber" crystal, a Force-amplifying talisman that was included in early drafts of the Star Wars story, but later eliminated by Lucas in favor of making the Force a more ethereal power. It's nice that Foster really did go to lengths to work in Lucas' original ideas for the saga and incorporate elements that, at least at one time, Lucas had intended to use. Although that really wasn't a concern for Lucas, as he granted Foster a great deal of leeway in developing the story. The only real key requirement was that many of the props from the previous production could be reused if the novel was adapted for film. Foster's decision to place his story on a misty jungle planet was also intended to reduce set and background costs, and according to Foster, Lucas's only request upon inspecting the manuscript was the removal of a space dogfight undertaken by Luke and Leia before crash-landing on Mimban, which would have been effects-heavy and expensive to film. 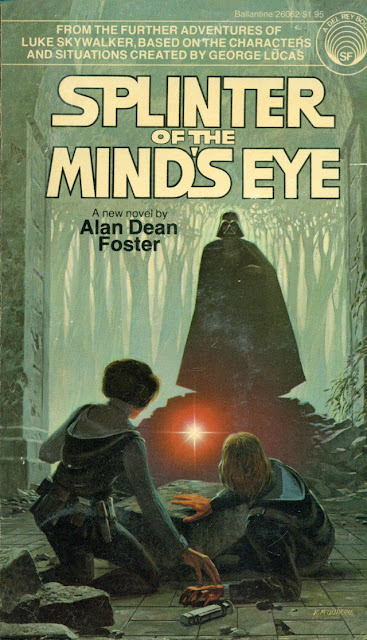 Of course, none of it mattered anyway as by the time the novel was published, Star Wars had broken box office records, and the film adaptation of Splinter Of The Mind's Eye was abandoned in favor of Lucas' vision of a big budget sequel. 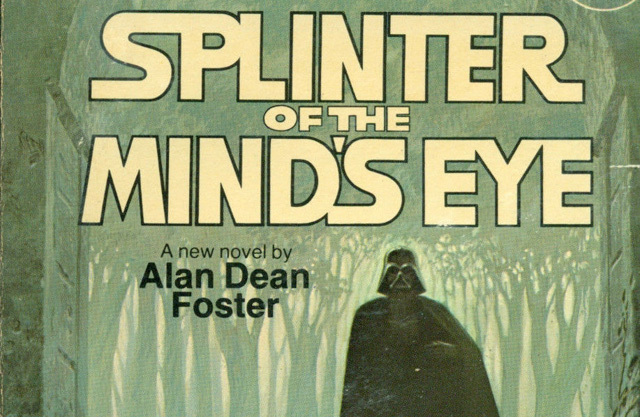 Splinter Of The Mind's Eye is a must-read for any Star Wars fan, even if it's to just get a glimpse of what could've been had Star Wars not caught the imagination of the public back in 1977. It's fast paced, slightly claustrophobic at times, but it doesn't outstay it's welcome. For curiosity value alone I'd give it a three out of five. Matt has a passion for just about anything from the 1980s, and prides himself on never having seen the movie Grease.